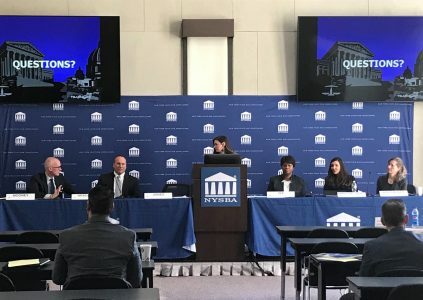 Andrew R. Jones and Rachel Aghassi were speakers at the New York State Bar Association’s Legal Malpractice 2019 CLE Live Program series on Tuesday, March 19, 2019 in Albany, NY which was also streamed on a live webcast. FKB’s A. Michael Furman is the Overall Planning Chair for this program series. 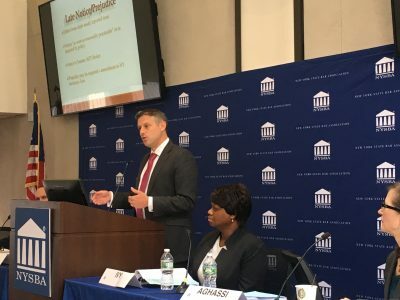 Andrew R. Jones presented a CLE on “Identifying and Responding to Professional Liability Claims.” Mr. Jones provided invaluable advice on notifying your malpractice carrier of a potential claim and what is covered under a typical LPL policy. Rachel Aghassi moderated a lively panel on “Sources of Legal Malpractice Claims & Ethical Considerations.” The panel included several other experts in the professional malpractice industry which discussed common types of malpractice claims, claim trends, and preventative measures to avoid claims. This program is designed to educate attorneys on how to prosecute and/or defend a legal malpractice action. In addition, this program educates attorneys about their legal malpractice exposures, what they should do in the event that a lawsuit or a grievance complaint is filed against them, and what they should do when situations arise that indicate that a legal malpractice claim is likely. Both solo practitioners and members of larger firms would benefit from knowing how to assess professional liability risk and manage legal malpractice litigation. The program in Albany took place on March 19, 2019 and will take place in other locations in New York. A. Michael Furman will speak at the New York City program on March 25, 2019. The Rochester program will take place on March 28, 2019. Andrew Kowlowitz will speak at the Westchester program on April 16, 2019.